An excellent book that covers every conflict US soldiers participated in from the Colonial Wars 1755-1785 through to 1990. The book features over 160 full color plates with 500 separate figures in uniforms with details, weapons, equipment and insignia. The book also features 100 black and white and colour illustrations. 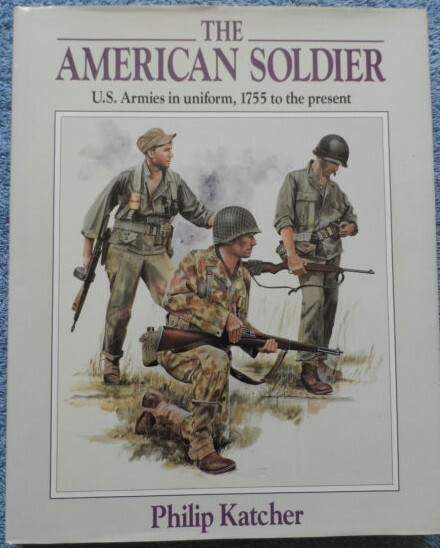 The American Soldier: U.S. Armies in Uniform, 1755 to the Present includes seperate sections on elite units: Rangers, Special Forces and Marines. The book also includes special sections for infantry and combat equipment. The dust wrapper is in near fine condition, clean and fresh, with minor creasing to the top edges. The binding is secure and tight. Inside, the content is very clean and in fine condition. A very nice copy.